De Lis Group and Prime Social Group are thrilled to announce the lineup for the 3rd annual ABROADFEST! Following the success from the previous two sell-out years, ABROADFEST is having its biggest lineup to date. 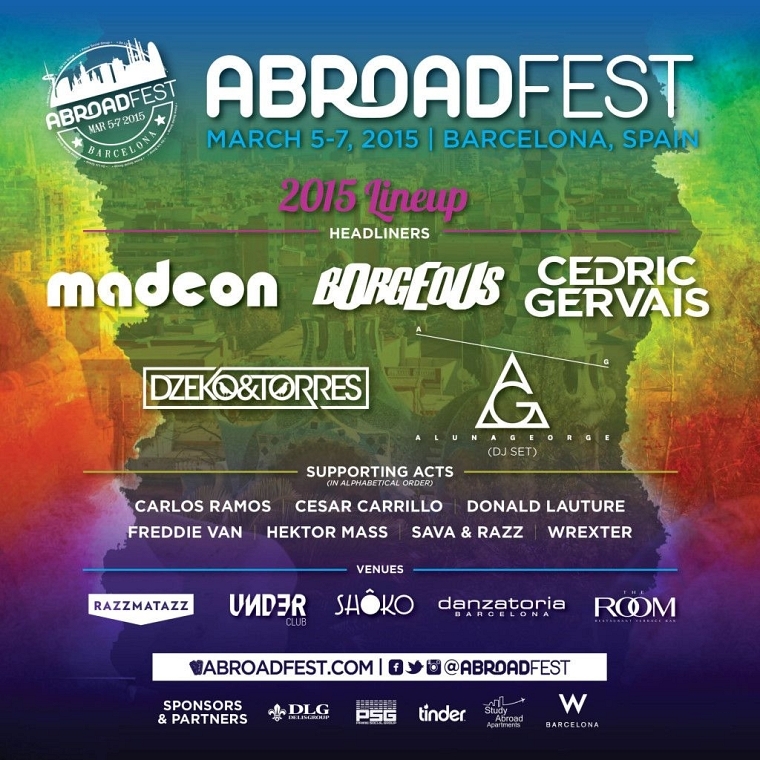 ABROADFEST 2015 features MADEON, CEDRIC GERVAIS, BORGEOUS, DZEKO AND TORRES, ALUNAGEORGE & more! ABROADFEST Night Two (Friday, March 6th) continues onto Under Club (Calle de Tarragona 141) with Beatport chart-topper, BORGEOUS. Attendees are also invited to “Cocktails on the Terrace” 6PM-8PM at Danzatoria (Ramón Trias Fargas, 2) to start off the night. ABROADFEST is in the 3rd consecutive SOLD OUT year featuring the world’s top DJs for students studying abroad. Limited amount of single day tickets solely remain for Night One (Thursday) while supplies last. Visit www.abroadfest.com or follow @ABROADFEST on social media for all of the latest information. ABROADFEST attendees are highly encouraged to book at the W Hotel for a luxurious stay while enjoying the festival.